There is a reason I avoid Wal-Mart and it’s not for any of the reasons you may think. It’s the same reason I avoid certain isles in the grocery store… I don’t need that sh*t. Last week the roommates and took a trip to Wal-Mart for a few things for the new apartment and against my better judgement I brought my wallet inside, convincing myself that all I would buy was a set of nails and picture frame fasteners. 20 minutes and $20 later, I left with my hanging set, a new canvas print for my gallery wall, a huge bag of tortilla chips and the big box of Lucky Charms. What? 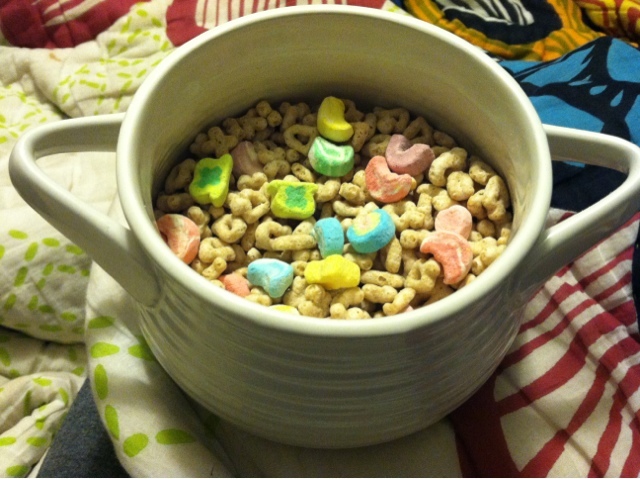 I haven’t had cereal, let alone Lucky Charms in years. But thanks to Wal-Mart and their everyday low prices, for the last week, I find myself with a pot of gold each night before bed. I can’t help myself. After all, they are magically delicious. Which always makes me wonder, why not have a box of just the marshmallows. That is the only reason you buy them anyways. Cocoa Puffs doesn’t waste time mixing in toasted oat cereal! I silently pat myself on the back for being adult enough to not just pick out the marshmallows and toss the rest. I see this as a true sign of adulthood. 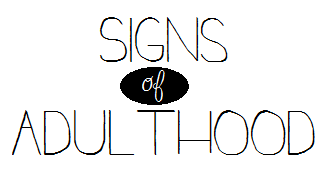 That gets me thinking about some of the other signs of adulthood. I mean sure, you are considered an adult by society when you turn 18, but at what age do you actually realize you’re an adult? My Lucky Charms moment, was not this first time this year that adulthood slapped me on the back and said, “Welcome to the other side”. I read Time Magazine regularly. Like more regularly than I read Instyle, Cosmo or Elle. And by read I mean I actually read it cover to cover, I don’t just scan the pages for pretty clothes or read about 101 ways to please your man. When I am feeling really mature I even grab myself a copy of Entrepreneur or Wired. Speaking of reading, I hardly ever read chick lit any more. Now my free time is spent reading about how to be a successful women in business, communication tactics, personal growth and financial management. I bought the sequel to the Devil Wears Prada a couple days ago and I haven’t even opened it up yet!! What happened to me! I look forward to getting up early on Saturday morning to go to the farmers market and then yoga. I am legitimately excited about it. Gone are the days that I would sleep in past noon. And you must be crazy if you think I am going to go out drinking Friday night. I can’t risk a hangover messing up my date with my beloved almond hummus, homemade goat cheese and fresh cherries. And while we are on the topic of drinking, I am content with just one glass of wine a night. If it has been a particularly hard day, I might pour myself a vodka tonic, but just one. My binge drinking days are over. I’m not as mature as I thought. And seriously, no one wants to eat just the toasted oats sans rainbow shaped marshmallows… no one! 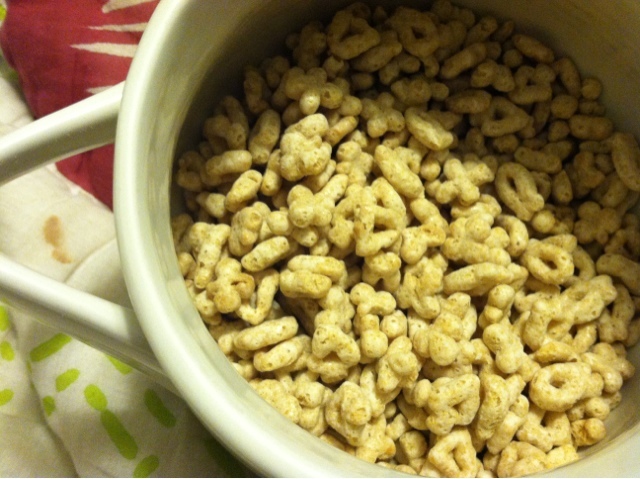 It might as well be a bowl of dry Cheerios. What silly things make you feel like a grown up?